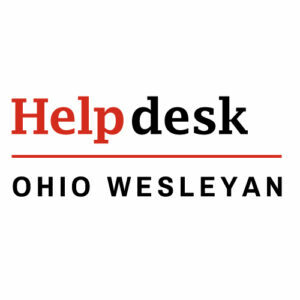 Please note: this support information is for Ohio Wesleyan University employees only. Anyone else should see ADP’s own support page. Ohio Wesleyan University has engaged the services of Automatic Data Processing (ADP) to assist in the processing of payroll and several other human resources functions. This provides employees–faculty, staff, and student workers–access to timecards, earning statements, benefits information, and tax forms 24 hours per day, 7 days a week. Enter the registration code obtained from the Human Resources department where prompted and click the Next button. Verify your identity by entering your name and Social Security Number. Enter your name as it appears on your paychecks. Then click the Next button. Enter your email address and click the Next button. Your phone number is optional. Enter your place of birth, and select two security questions. Enter the answers to the questions you selected. Then click the Next button. Your ADP User ID is automatically assigned to you. Make note of it, as it is different from your OWU BishopApps username and email address. Enter a password twice and click the Next button. Select “ADP Portal” at the bottom of the screen and click the “Log On” button. ADP recommends using Internet Explorer to access their services. Other browsers do not always display ADP screens correctly. More detailed instructions, with screenshots, are available for OWU employees only. For that and any other questions or problems with the registration process contact HR at HR@owu.edu or 740-368-3388. After logging in, click on your name in the top right corner and select Preferences. In the top menu click Security and then the Questions tab. Q: What is the self service registration pass code? Q: Can I change my User ID to match my email address? A: No, the User ID format is standard for all ADP clients and cannot be changed on an individual level. Q: If I have already registered as part of the test group, do I have to register again? A: No, you should only register once. Q: If I had online pay statements with a previous employer can I access them through this account? A: Yes, if the previous employer was with ADP and you worked for them less than 3 years ago. Q: How much history is available on I-Pay? A: You can see OWU pay stubs and OWU W-2 statements back to July 2010 or your start date, whichever is more recent. Q: What do I do if I forgot my User ID? Q: When I log in to the portal site why are some of the screens blank? A: HR will continue to expand the information available on the site. Employees will be able to see their benefit information and use the portal for on-line benefit open enrollment in the near future. Watch your e-mail in-box for additional communications about the site. Q: When and where am I able to access the portal? A: You are able to access the site 24/7 from anywhere you have an internet connection. Q: I had too many failed log-in attempts and the system locked me out – what should I do? A: The system is set up to re-activate your account after 30 minute. Please try again later. If you were locked out because you have forgotten your User ID or password, please see the questions above. Q: I am an International student and do not have a Social Security Number, how do I register? A: Please contact student employment for the number you should use in place of a SSN. Q: Am I able to access a link to the ADP Portal from the OWU website? A: Yes – from the Faculty/Staff on the OWU home page, click on the link to Human Resources. A: ADP is committed to ensuring that your information is kept confidential. As soon as you log in, your connections to ADP’s Portal is secure. If you leave your computer unattended or you forget to log off before exiting the site, you are automatically logged off after 20 minutes. If you are logged into ADP’s Portal and need to walk away for any reason, click Log off of lock your workstation. When you log off, your secure connection will be terminated, to view your information again, you will need to log on again (re-enter your User ID and password) to view your information. Select a password that would be difficult for others to guess. Do not give your password to anyone. Do not save passwords on your website or leave written notes with your password near your computer. Request an “Employee Quick Reference Guide” to assist in setting up internet and Adobe security settings to prevent historical files of your pay statements from being left behind on your PC. Q: Now that we have online pay statements will I stop receiving the paper pay stub through campus mail? A: Yes, beginning June 1, 2012 we will no longer distribute paper pay stubs. If you still receive a live check at that time it will be mailed to your home address. Live checks for students will continue to be delivered to the student mailboxes. Q: Who should I contact if I have questions about the information I see when I log into the system or if I want to change the information I see? What if I just have general questions or comments? Q: Why does my Administrator show a name of someone that is no longer an OWU employee? A: The Administrator field was populated when we initially went live with ADP for payroll. HR is in the process of updating the Administrator field and adding an email address for the Administrator so you can contact the correct administrator directly through the ADP site. For any questions or issues regarding the ADP Self Service Portal please contact OWU Human Resources at 740-368-3388 or e-mail hr@owu.edu. If you are a student please contact the Student Employment Office at 740-368-3370 or e-mail studentemployment@owu.edu. For all other issues and questions please contact the Information Services Help Desk.